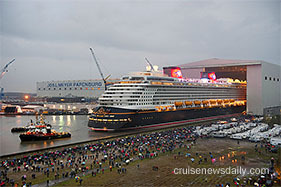 The complete story appeared in the November 1, 2010, edition of Cruise News Daily. Royal Caribbean's newest ship, Allure of the Seas, passed a noteworthy milestone on its way from the shipyard in Finland to its home port in Ft. Lauderdale. It is shown here passing under Denmark's the Storebaelt Bridge (Great Belt Bridge) which has exactly 65 meters of clearance. Allure retracted its funnel to help fit under the bridge. With the funnel retracted, and in its normal cruising configuration, it is exactly 65 meters high. To provide a margin of safety for additional clearance, the ship took on extra ballast water so it would ride lower in the water for this part of the journey. The retractable funnel (which only goes down about meter) had to be built in specifically to help the ship clear this bridge. There is nowhere else Allure will sail where clearance is this critical. 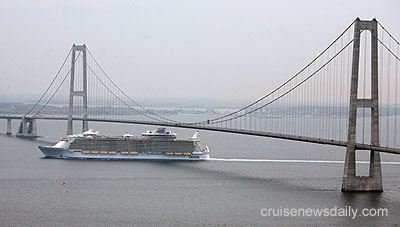 Details appeared in the November 1, 2010, edition of Cruise News Daily. Allure of the Seas left the STX shipyard at Turku this morning bound for its home port in Ft. Lauderdale, where it is scheduled to arrive 13 days from now. In a way, it kind of wraps up the story that began at that same shipyard 40 years ago. 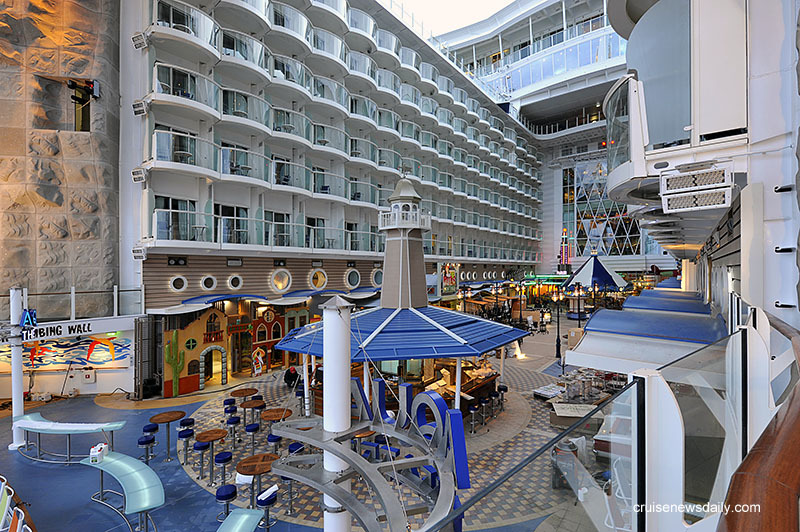 In this Cruise News Daily article, which appeared in the October 29, 2010, edition, we look briefly at the contrasts between Royal Caribbean's first ship and its latest, the future of the yard, and what the line is saying about its future newbuilds. Did you know Seattle-based Holland America Line has a reservation office in Williston, North Dakota? Don't highlight it on your map in ink, because at the end of next month they are closing it, but they will still have about forty reservation agents in Williston. The complete story appeared in the October 29, 2010, edition of Cruise News Daily. CND subscribers also read about Port Everglades' record-breaking year ... a new free service for P&O passengers ... and an "explosive" issue in Seattle. Details of these items appeared in the "Other Things You'll Want to Know" column in the October 29, 2010, edition of Cruise News Daily. Royal Caribbean's Allure of the Seas left the STX Europe yard in Turku, Finland, this morning for its home port in Ft. Lauderdale. The crossing is scheduled to take 13 days. Note that the retractable funnels seem to be down in anticipation of passing under the Great Belt Bridge tonight. Cunard is a line of history. The line proudly traces its roots, and each ship they build is filled with reminders of that history. They also fill their ships with beautiful art - all types of artwork. There are massive works as well as small and exquisite ones. There are traditional and more contemporary pieces. There are serious and traditional subjects and more whimsical ones. Cunard invests what most people would consider a fortune in these. Aboard the new Queen Elizabeth, surprisingly, one of the displays that's getting the most attention from passengers was one of the least expensive. And this is its (creepy) backstory. The complete story appeared in the October 28, 2010, edition of Cruise News Daily. 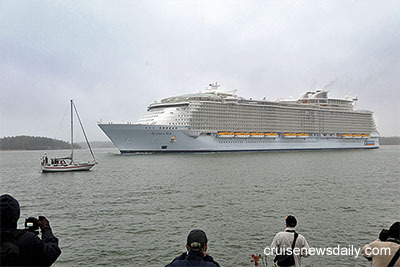 STX Europe delivered Allure of the Seas to Royal Caribbean Cruises Ltd this morning at its Turku Finland Yard. The ship will depart on Friday for its home port at Ft. Lauderdale. 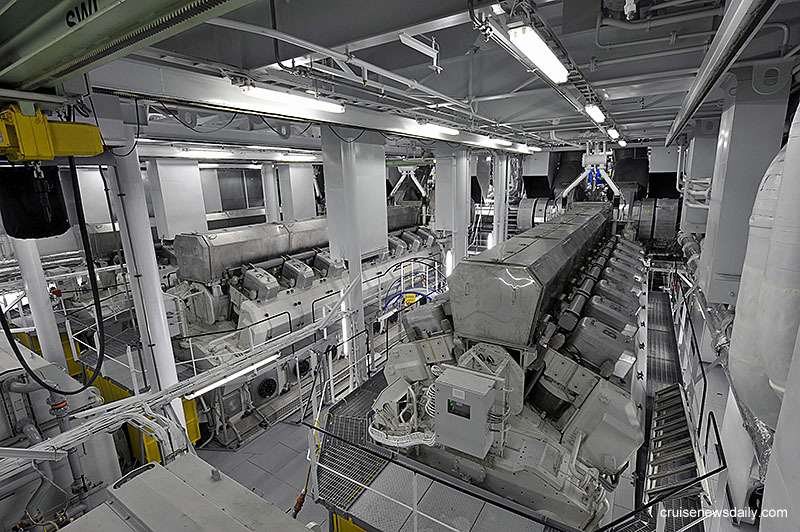 Shown above are the ship's main engine room and the Boardwalk area. Larger versions and additional photos. Details appeared in the October 28, 2010, edition of Cruise News Daily. If someone tells you that their cruise leaves from "Florida," these days more often than not they will really be sailing from Port Everglades. The Broward County port at Ft. Lauderdale is on track to become the world's largest cruise port any day now. Each year, for many years in a row, they not only break their volume record from the year before, but there are at least a couple dates in the season where they either break their all-time record for number of passengers handled in one day or they flirt with the record. Passengers are really happy with the port. It's easily accessible from the airport and from highways. Parking is convenient, and there are even offsite options. The terminals are modern and filled with passenger conveniences. Even more important, the cruise lines are all happy working with the port, and they show it by bringing more and more ships there. How is it that Port Everglades keeps everyone so happy? It's because they have a secret weapon no other port has. The complete article appeared in the October 27, 2010, edition of Cruise News Daily. CND subscribers also read about Starbucks going to sea for the first time aboard Allure of the Sea ... Portland, Maine, ready to expand ... and MSC making birthday wishes come true. Details of these items appeared int the "Other Things You'll Want to Know" column in the October 27, 2010, edition of Cruise News Daily. P&O Australia canceled two additional sailings of Pacific Jewel today. CEO Ann Sherry took to You Tube to explain the situation to customers. While the message will be upsetting to the customers who are affected, we expect they will feel better about it having heard the CEO tell them, we are to presume in her own words, what went into the decision and an apology. With cruise lines trying to figure out how to embrace social media (and the internet), we look for this to be something you are going to see used a lot in the future. P&O Australia should be congratulated for being the first. Disney is an entertainment company, and they are big on imagination, so one of the most anticipated announcements about Disney Dream has been the one that describes the production shows that will be aboard when the ship enters service in January. And today that day came. The complete article appeared in the October 26, 2010, edition of Cruise News Daily. CND subscribers read about a lifesaver for STX Turku ... NCL's IPO ... late arrivals in St. Thomas caused by the pilot boat crews not showing up for work ... a $10,000 winner every month aboard Celebration Cruise Line ... NCL gets some competition in Hawaii as American Safari schedules 7-day itineraries ... an exceptional offer from MSC where you buy one cruise and get another free. Details of these items appeared in the "Other Things You'll Want to Know" column in the October 26, 2010, edition of Cruise News Daily. By Norwegian Cruise Lines' own admission today, it was a poorly-kept secret, but they have ordered two new ships from Meyer Werft. As far back as June, Meyer's CEO Bernard Meyer was seen with NCL CEO Kevin Sheehan aboard Norwegian Epic during its introduction, and even before that there was talk in the industry of NCL shopping yards for a rumored order. So today, NCL made it official that they have sealed the deal with Meyer for two ships of a new class, slightly smaller than Norwegian Epic, for delivery in April 2013 and the spring of 2014. The complete article appeared in the October 25, 2010, edition of Cruise News Daily. With upscale dining options such as Chef's Tables all the rage on mass market and premium lines, Holland America Line seems to have found a new one that will supplement those they already have. The line has entered into an exclusive agreement with Le Cirque restaurants to bring the establishment's cuisine and experience aboard the Holland America fleet. It will be offered at least once each cruise in the Pinnacle restaurant. Details appeared in the October 25, 2010, edition of Cruise News Daily. Repairs of Celebrity Century's rudders were completed on schedule over the weekend at the Chantier Naval de Marseille shipyard in Marseilles, and the ship departed for Barcelona after midnight (Monday morning). Boarding in Barcelona was delayed from the original schedule, and the ship departed just after 11:30pm on October 25, but the delay will not affect the itinerary. Both of Celebrity Century's rudders were reinstalled last night at the Chantier Naval de Marseille shipyard. Celebrity says the repair work is proceeding according to their schedule to return the ship to service for Monday's sailing from Barcelona. The drydock is to be flooded later today, and sailing from Marseilles is planned for midnight. Passengers aboard the October 25 sailing should proceed to Barcelona as scheduled.